This latest print issue of Gdansk In Your Pocket is the 50th that we have published. With three issues annually it represents a lot of years and this autumn will see the 17th anniversary of work commencing on the first issue which came out in the spring of 2000. That issue was put together by a small but incredibly enthusiastic volunteer force featuring an Irishwoman, Englishman and a handful of Poles who were all convinced that if the world just knew a little more about Gdansk, Sopot, Gdynia and the surrounding area, that they would visit and see for themselves what a wonderful place it was. Local businesses greeted them with a certain amount of wonder and suspicion. Why would a foreigner write about Gdansk as an international tourist destination and why on earth would they do that for free (then as now a listing in the guide is written by us and is not paid for or influenced by the business). Where was the catch? Thankfully, a few businesses, mainly out of their kindness for these poor, optimistic, crazy foreigners, bought a few ads and slowly but surely the guide began to develop. Pages and pages of content were written, facts checked and re-checked (we counted the steps in the tower in St Mary’s Basilica years before we saw it posted anywhere else) and, one for the older people among you, HTML tags were added to the text to make them suitable for posting on our ‘Internet site’. All this was done squeezed around one computer in the spare room of a flat in the Chelm district, more often than not while speaking in hushed tones so as not to wake the little boy asleep in the next room. We’d like to take this opportunity to thank all of those great people who’ve worked on Gdansk In Your Pocket over the years and supported us in whatever way – whether you’ve been a writer, researcher, salesperson or bookkeeper or whether you’ve helped us along the way as an advertiser, distributor or reader. We are sincerely grateful to all of you and we hope that you’ll understand if we don’t try a roll call of each and every one of you. A last word. 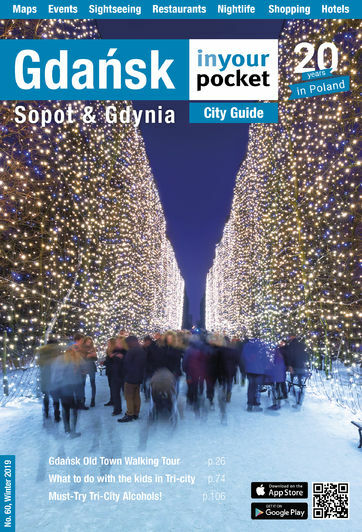 We don’t usually dedicate a guide, whether it be Gdansk or any of the other cities we cover in Poland, but we hope you’ll excuse us if we make an exception with this issue. We’d like to dedicate this 50th issue of Gdansk IYP to Liam Kelly-Włodarczyk and his little sister Sinead. Liam was that little boy who’d be asleep in the other room that we mentioned above. In the weeks leading up to the publication of this issue Liam and Sinead lost their mother Eimear, to cancer, at the ridiculously young age of 46. Gdansk In Your Pocket remains a tribute to Eimear’s enthusiasm for the city she’d made her home and to look at Gdansk today is to see that she was right to be so optimistic. Rest in peace Eimear.